My daughter is going to a sleepover this weekend. This is all the rage for 10 and 11 year old girls for their birthdays. I am not a massive fan because "sleepover" is a poor description of what actually occurs and I don't really want to deal with a grumpy child all weekend but it's the school holidays and I find it very hard to say no when it's one of her best buddies. She tells my her friend loves elephants. A quick search on Ravelry brought up ANOTHER Lucy Ravenscar pattern. This is my third free pattern (#1 witch's cat, #2 little lucky pig). I think it's high time I actually purchased something from her. It's going to have to be her Star Wars Crochet Kit which is available on Amazon. One of my workshop students has bought the kit, on my recommendation already, and is making a baby mobile with each character for her latest grandson. But I know these are going to be BIG with the new Star Wars movie coming out later this year and I need to get a head start. I really really like Lucy's patterns so much: the way she uses bobbles for feet and how her patterns are in one piece with no seaming and sewing on of fiddly individual little parts. I am bad at putting my projects on Ravelry but I will get around to it because I want to let Lucy know how much I love them. 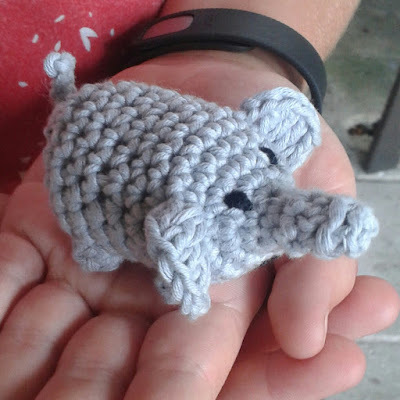 Here is the elephant link on Ravelry. I feel that my elephant will be the first of a herd.